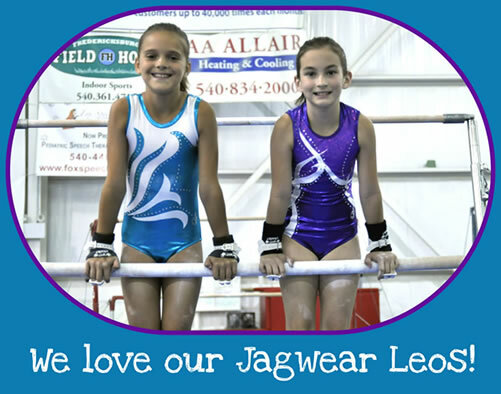 Do you love your Jagwear suit? Do you want everyone to know why? Send your experience with our suit to our email address: leigh@jagwearleos.com and we will post it here on our Testimonials page. where the leo's cam from. to tell everyone about our designs and FAST service. "I think it's time that I thank you for the awesome competition suits you designed for the girls of our Canadian Gymnastic Olympic Team this year in London. They looked outstanding out on the Olympic floor of the O2 and made us all proud Canadians!! Great job to you and your staff for producing such world class quality and design!!" Hi Clara – my leotards arrived, quickly too!!!!! They look absolutely fantastic! Her birthday isn’t for a couple of weeks, October 6th, but they look like they’ll fit perfect and I cannot WAIT for her to open them…I will send a picture. Thanks for the excellent customer service and super fast delivery! see what Dominique will be wearing today. I received the bra and maple leaf rhinestone suit on Friday; they're both terrific. Thanks again for such great products and customer service. I just wanted to let you know how happy my daughter is with her new suit. I am also equally impressed with your service over the years. This is not the first time we have ordered with you. The first suit I ordered was when my daughter was 4. Now she is 8 and in pre-competitive gymnastics. I will always order with your company. I will also always recommend you. ( not that you need it)! I'm a first time internet orderer of Jagwear and am happy to tell you the service was fast and the product (leos) are wonderful! My daughter had been away and just returned to try on the recent order (details below) - sorry I couldn't get the information to you sooner - both the positive feedback and the return request! The Katie suit fits beautifully but the Jennifer is a little small so I'd like to exchange it for a size 12. I also would like to order another suit and am hoping you could ship new suit and exchange suit together once you receive the return suit. Do I need a return number or anything - to whose attention shall I ship the return? Thank you so much. I love a quality Canadian product and you guys make everything so easy! As usual, your promptness AMAZES me as well as the beauty of your gym suits!! I cannot believe I just ordered them yesterday and they are already here! I love your company, I love the suits and so do my girls. It is my pleasure to introduce you to Donna Cowell, a very successful businesswoman, and business-owner (Jagwear) and a very important partner to Gymnastics Ontario. Donna will be playing a very big role at the Canadian Gymnastics Championships, as her apparel line is probably the most current and sought after, by all those gymnasts (and their parents) with an eye for detail, quality and the latest in fashion! Donna, it is my pleasure to introduce you to Jane Dalgas, who is also a very successful business-woman, with her own business, and with a tremendous amount of positive energy and business sense. I know that the two of you will become great business associates and am happy to make the introduction!! Thank you very much Donna for taking the initiative here and assuming responsibility for the 2009 Canadian Gymnastics Championships pins. This is long overdue but a huge THANKYOU... to yourself and Jagwear for assisting our club and getting our suits out so quickly. When the last tracksuit arrived so quickly the athlete was thrilled as was I. I thought I would forward this photo to you so you might see how good the girls looked. Clara, thankyou for being so patient and helpful. I just absolutely love your site, and love the suits we got for our little girl last year which still look brand new. I was wondering Donna, if you ever get any used little girl's suits in or if you have any sales in the future, if I could be contacted? I'd greatly appreciate it. My little girl, Alexis, is 4 1/2 years old, very small and I'm always looking for a great deal! I'd love to special order your gorgeous suits, but unfortunately on a one income budget, we simply cannot afford very much. Maybe if gymnastics turns out to be her thing, and she gets into competitive, that would be different, but this is just for advanced kindergym class at Champions Gymnastics in Peterborough. Hey Serena! I just wanted to say thank you so much for finishing my suits so quickly! You guys were incredibly helpful, as always, and I totally couldn't believe that you had finished them on the same day that I ordered them! Thanks for making them so fast, I've already worn both of them to gym. They fit great, and everyone loves them, especially the new racerback cut! Thanks again and I'll see you soon. Hi Donna, I just wanted to let you and your team know how pleased we are with Adrianna's suit. She wore it to Provincials and she looked awesome! Your design consulting and expert fitting made a stressful decision so much easier! Thanks to Serena for her help and to Clara for handling all my enquiries. Do you know where I could get her suit "framed"? She loves it so much she wants to save it forever!!!! Once again...thank you for all your hard work! Hi Donna, Shelley Bellamy here at Saugeen District in Port Elgin-I just opened the suits and they are fabulous-the girls will be so excited! Thanks for the prompt service and the 'extra' of the red matching hair ties-they will accent the suits well. We just had a small practice meet yesterday and the girls were asking when I thought they would be in-a great surprise to get them today-I will arrange for prompt payment today. Thanks again sooooo much for your hard work-we do appreciate it very much-we will pass thed word about Jagwear's great service at CWOSSA and OFSSA competitions. We have purchased over fifty suits from you over the past six years. We have purchased our Jagwear merchandise in several ways during this time....whether it be in the proshops of the clubs that we have trained at, various competitions, or directly through you. We have purchased many items including short sleeve training suits, crop tops, shorts, and of course....custom made long sleeve competitive suits. We have never had a problem with the suits at all!! Despite daily wear and tear of our daughter's training and subsequent daily washes....the suits have weathered it all! In fact, I have never had to discard a gymsuit once our daughter has outgrown it...we always have been able to pass it along! I want to take this opportunity to thank you and to let you know that we plan to continue to support Jagwear and that we look forward to seeing the many new colours and different styles that Jagwear has to offer! Today we received the gymsuits we ordered from you for Provincial Championships. We are extremely pleased. Thank you so much. I just received the new long sleeve competitive suit for my daughter last night and have to tell you that it's just beautiful! She modeled it to her group last night and they all loved it. It is sometimes hard ordering things online. You really don't know what the final product will really look like but this was just perfect!! I will see you in Caledonia at Elite Ontario. I just presented two wonderful leos to a very suprised 10 year old little girl. She looked at me and said "I'm not in trouble?". She tore through my office showing everyone the "coolest" leo's she had ever seen. You did a remarkable job with the leo's and we are beginning to distribute pens and talking to coaches tonite.